Lancashire are hoping to bring back memories of their ‘Kings of One-Day Cricket’ era by reaching what could be one last Lord’s final in this summer’s Royal London Cup, which starts today. Lord’s was almost a second home for the Red Rose faithful through the 1970s, 80s and 90s when they played in 16 Lord’s finals and won 11 of them under captains such as Jack Bond and Mike Watkinson. Current coach Glen Chapple was a huge part of their success in the mid-1990s. Lancs won the one-day cricket double in 1990 and 1996 with Chapple famously taking 6-18 against Essex in the 1996 NatWest final. After this summer, the 50-over final will move to Trent Bridge after the counties agreed a proposal to alter the domestic schedule over the next few years. And fate would have played its part if Lancashire get to a Lord’s final for only the second time since 1998. The county have not got beyond the group stages since 2012, when the competition was played across 40 overs per side. 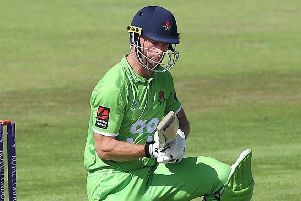 Ahead of their North Group opener against last summer’s semi-finalists Worcestershire at Old Trafford this morning, Chapple said: “Our form in 50-over cricket has been improving, but we’ve not been successful in that format for a long time. “The last two years, we’ve shown improvement and have played games where you think, ‘That’s good enough cricket to win the competition’. But we haven’t put it together for enough matches. That’s our challenge this year. “It’s a tough competition to win, but it would be a great carrot to think that you might play in the last final at Lord’s. “A Lord’s final should still be one of the very best days of the season, including international cricket. Lancashire will have Jimmy Anderson available for the competition given the Test match summer does not begin until late July, but it is highly likely that he will not play in every game. “Coming to Old Trafford watching games in that era, that’s what got me into cricket,” said the England legend. “I came here and watched a semi-final against Yorkshire and went to Lord’s for the final against Kent in 1995. I loved that era. Lancashire will be without Liam Livingstone for the entire group stage due to IPL duty, while Alex Davies is a major doubt for the early games with a right hand injury sustained during the County Championship win over Middlesex at Lord’s. But Australian overseas all-rounder Glenn Maxwell’s inclusion ahead of the World Cup is a huge boost. “It would have been nice to have them both (Livingstone and Maxwell),” added Chapple. “Liam experienced as well as a talented one-day player. We’re just going to have to manage without him. “It is a blow, but that’s just one of the things about modern cricket. “In white-ball cricket certainly, Glenn’s one of the best in the world.